Inicio › Novedades y Articulos › Informes › Racing Team ADK (Tielt-Winge, BE) excel and dominate the interprovincial race from Vierzon, thanks to super stock pair! Racing Team ADK (Tielt-Winge, BE) excel and dominate the interprovincial race from Vierzon, thanks to super stock pair! The team of yearlings claimed a double victory, winning a 1-2-4-5-6 Interprovincial of 5,830 YLs, and the old bids win a 2-5-9-etc. of 9,892 old birds. The team claims a 2nd-3rd-4th-8th-9th-10th-14th-15th fastest overall of 15,722 pigeons. This is an exceptional performance! Every once in a while you come across a result that seems almost too good to be true - a result beyond category. In The Netherlands we have Bas Verkerk who is known to deliver such results every once in a while, and so did Ludo Claessens back in the days. 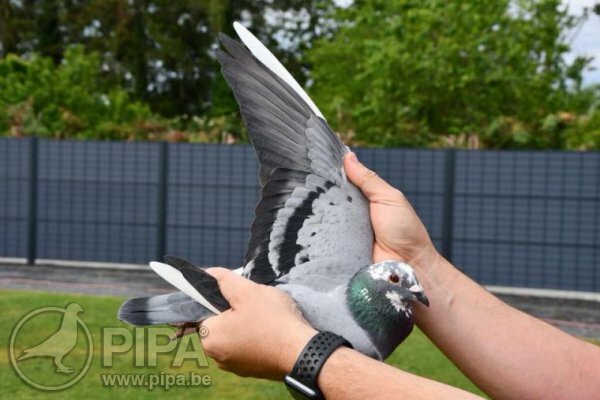 These kind of results are rather uncommon here in Belgium, which could have to do with us having a larger group of similarly strong opponents, the location of the release sites, or the higher number of pigeons in each race. In the entire field of 15,722 pigeons the team clocked the 2nd-3rd-4th-8th-8th-9th-10th-14th-15th fastest pigeons, which is quite a display of strength. Pasal Ariën has been the mastermind behind quite a few outstanding results but this was a different story, even for him. This race took place in demanding but fantastic weather conditions, where there were no excuses. It was just a matter of being able to hang in there or to be left behind, it somewhat reminded us of a mountain stage in the Tour de France. This is an achievement that is hard to put into words, it is pigeon racing at the highest level indeed. And this achievement gets even more impressive if we zoom in on the origins of the winning pigeons. The yearlings that won a 1st and 2nd Interprovincial (Meghan Porsche and Prince Porsche) are nest mates, or each other's nest brother and sister. And the old bird that wins a 2nd Interprovincial (Spyder 006) happens to be a full sister of the two yearlings. In other words, three direct youngsters of the miracle pair of the PIPA Elite Center (PEC) Wacko Freddy x Lieve claim a 1st, 2nd and 2nd Interprovincial in their respective categories. 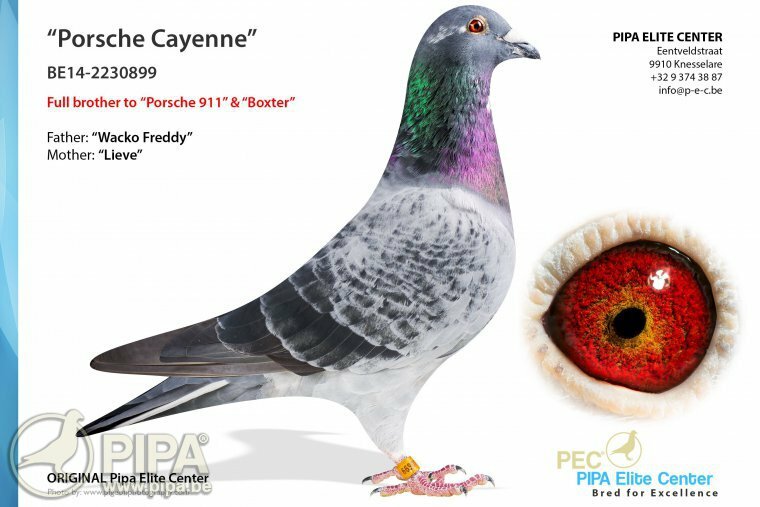 To add to that, turns out the 4th and 5th clocked pigeons are two youngsters of Porsche 911 - another son of Wacko Freddy x Lieve. This makes the team's achievement all the more impressive. 53rd Prov. Blois           3,122 p.
65th Prov. Argenton        1,510 p.
94th Nat. Zone Chateauroux 6,297 p.
159th Nat. Zone Bourges    4,813 p.
There is an interesting story behind the creation of miracle pair Wacko Freddy x Lieve, which was pretty much put together by Pascal Ariën. 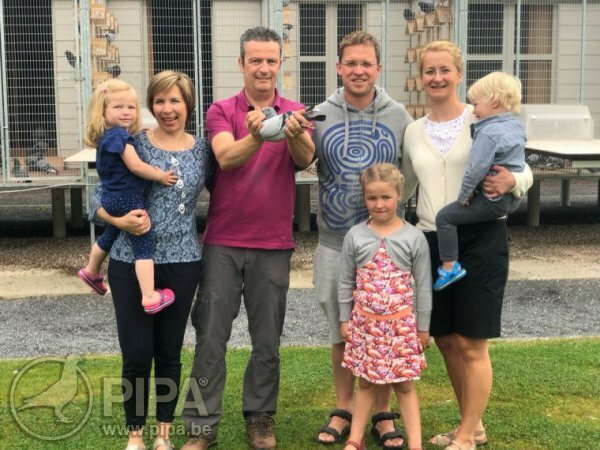 Pascal was on a visit to the PEC of Nikolaas Gyselbrecht when he got his hands on a daughter of stock breeder New Freddy: Blue Ace Freddy'ke. 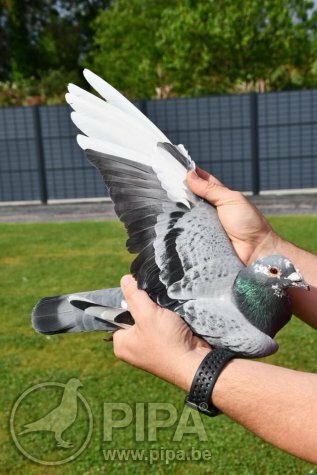 Pascal was determined to obtain his pigeon, because to him she was the perfect partner for his Porsche 088, which is one of his favourite breeding birds, bred from his own stars Olympic Wacko adn Norma. There was one issue: Nikolaas was not willing to sell Blue Ace Freddy'ke. Nikolaas eventually gave in, and the two pigeons were put together to breed none other than Wacko Freddy. This pigeon looked truly fantastic indeed, and he was paired to Lieve, a daughter of Bart Geerinckx's Gladiator. This pair proved a fantastic combination. - Porsche 911 BE14-2230911: 5th Nat. Ace Pigeon Longer Middle Distance KBDB 2015 (for his palmares, see picture). Click here for Porsche 911's pedigree. *Daughter Porsche 101 BE16-4129101: 5th Intprov. Vierzon 9,852 olds (8th fastest of 15,722 p.). *Daughter Porsche 440 BE16-4129440: winner of 5 top 10 prizes in the region. Click here for the pedigree of Daughter Porsche 440. *Daughter Porsche x Louise 313 BE17-4062313: 99th Prov. 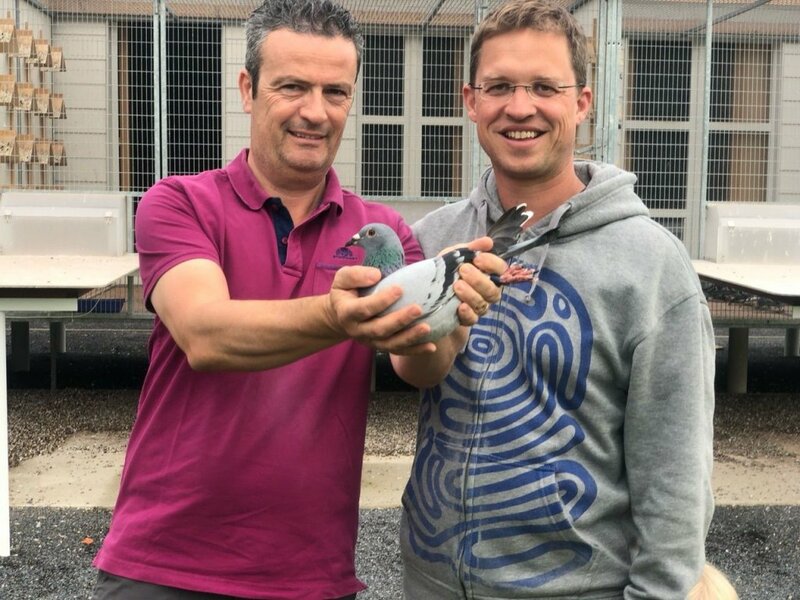 Vierzon 1,628 YLs and now 5 top 100 prizes of at least 1,000 pigeons and more. Click here for the pedigree of Daughter Porsche x Louise 313. -Boxster BE14-2230972: 8th Nat. Ace Pigeon Longer Middle Distance KBDB 2015, click here for the pedigree and the pamares of Boxster. -Sister Porsche BE17-4062221: 56th Intprov. Vierzon 5,830 YLs ’18. Click here for her pedigree. -Macan 112 BE16-4129112: 38th Nat. Limoges 10,565 p., 16th Intprov. Jarnac, 97th Nat. Zone Tulle etc… Click here for his pedigree. -Cayman 475 BE17-4062475: 52nd Intprov. Vierzon 5,830 YLs ’18 etc… Click here for Cayman's pedigree. 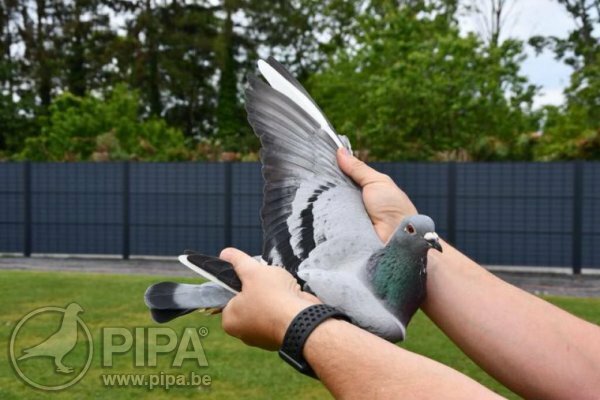 We asked Pascal Ariën what makes his pigeons so special, and he told us their racing birds appear to recover very quickly, while handling a lot of training volume. They would arrive home from a flight of up to 600 or 700km without visible signs of fatigue, ready for another day of training the next day. This is an important asset in the build-up to their next important race. These pigeons combine high intelligence, strength and very quick recovery. And it turns out their descendants all inherit those same qualities, which allows them to stand out from the pack. A breeding pair that breeds two or more super class birds is rare these days. Most pairs are unable to breed more than 1 big champion. Pascal agrees that this pair is truly unique, and he told us he never came across a similarly gifted breeding pair in his entire pigeon racing career, capable of breeding 10 great racing birds in three years' time. Pascal and Nikolaas agreed in late 2017 not to sell any more pigeons coming from Wacko Freddy x Lieve, and it was perhaps the best decision they ever made. It allows them to use the first three rounds for their own racing team every year, while moving the remaining youngsters to the breeding loft. 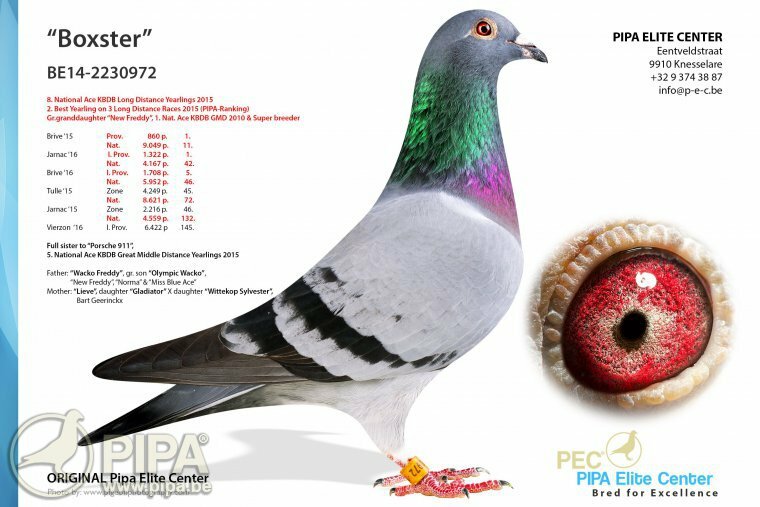 This in turns makes it easier to further incorporate this breeding pair's excellent genes into their existing pigeon family. Is this the foundation for another chapter in this success story? Many congratulations!